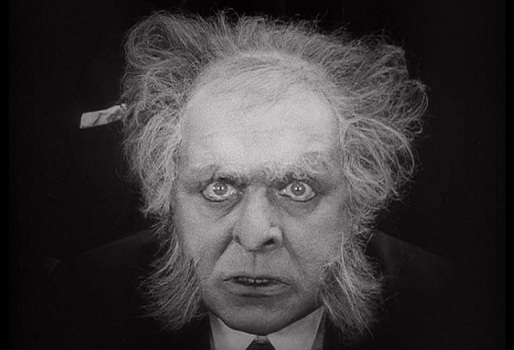 DR MABUSE - Part 1: THE GAMBLER (1922). Around Berlin at the time Lang made the two parts of DR MABUSE, there were ghoulish posters depicting a woman partnered with a dancing skeleton bearing the caption: ‘Berlin, you’re dancing with Death’. Lang was not yet a political person until he made METROPOLIS, enjoying a security in his life and work in the early 1920s; however he was not oblivious to the darker side of human experience and the discontent that fostered the rise of Nazism. He was fascinated by criminality and spent time accompanying the police on crime scene visits, research that inevitably bled into his work. 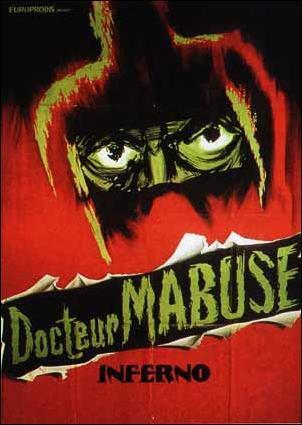 DR MABUSE, (composed of a first film in two parts followed by a later sequel in 1933 THE TESTAMENT OF DR MABUSE and the 1960 THE 1000 EYES IF DR MABUSE) details the life of a splendidly rapacious master criminal/master of disguise who also possesses a supernatural gift for mesmerism that makes Rasputin look like he’s barely trying. Such is Mabuse’s power that he can induce mind control and even physical illness in his victims from across the room even with their back turned. In this way, Rudolf Klein-Rogge’s fierce performance recalls Michael Ironside’s Revok in the Cronenberg classic SCANNERS. 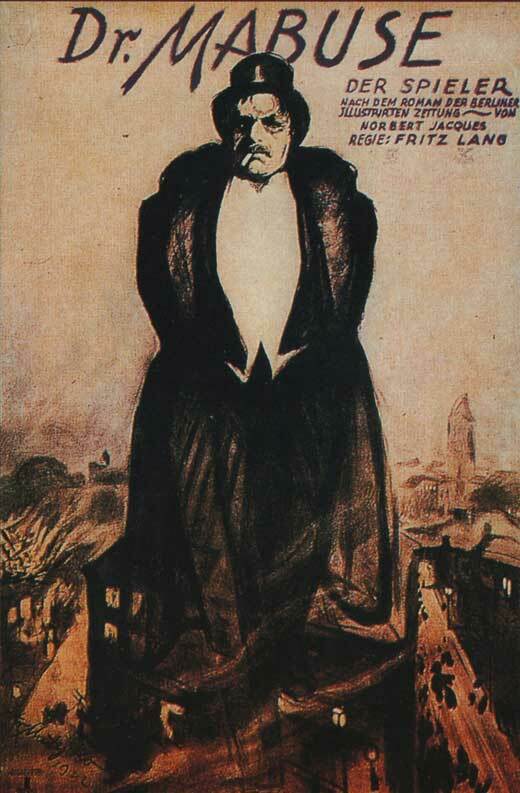 Klein-Rogge would go on famously to portray the scientist Rotwang in METROPOLIS and was also in DESTINY, as was Bernhard Goetzke who played a memorably haunting Death and here is Mabuse’s nemesis, determined to catch him almost at his own peril. Mabuse is a gambler who uses his disguise ability to enter gambling dens and with his hypnotic power persuades opponents to throw away perfectly good hands to give him victory. He is something of a Berlin kingpin as he also has a lucrative counterfeiting side racket and doesn’t restrict himself to mere cards. In the opening, he steals a business contract in order to cause chaos and a run on shares at the stock market to his benefit. Goetzke is State Prosecutor Von Wenk who goes after Mabuse. First, he shows the strength of character to resist Mabuse’s disguised card-player mesmerism but winds up gassed in a taxi-cab whilst pursuing his man and wakes up robbed and adrift in a rowing boat. Von Wenk then tries to use the charms of the ladies yet finds that the villain’s suggestive potency renders women heavily under his spell and resistant to betraying him. The dancer Cara Carozza (Aud Egede-Nissen) clams up and his attempt at using Countess Told (Gertrude Welcker) to wheedle the story out of her in jail is foiled when she is touched by how strong the Svengali-like hold of Mabuse is upon Carozza. DR MABUSE - Part 2: INFERNO (1922). 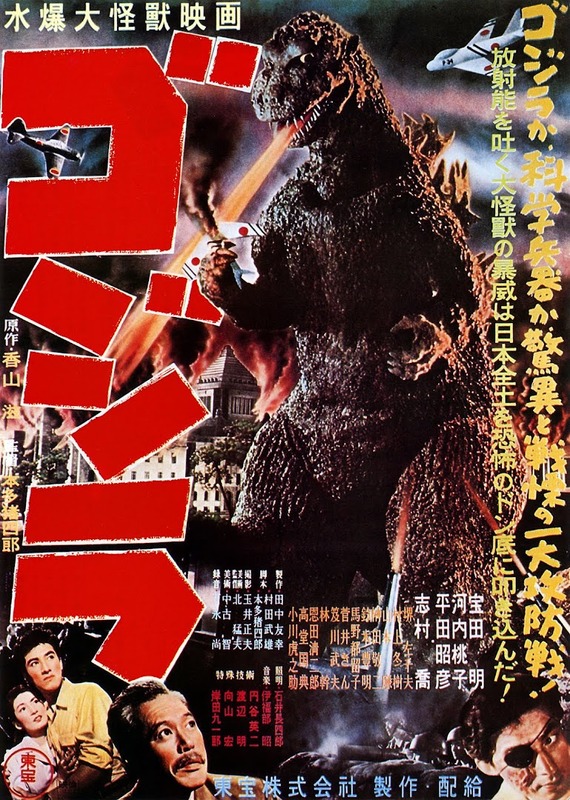 In the second part, Mabuse and Von Wenk battle again with each other, Mabuse sending a henchman to bomb Von Wenk’s office disguised as an electrician. The master criminal focuses his unearthly talent on inducing the Countess’s husband to kill himself with a razor-blade whilst treating him as a psychoanalyst. (Mabuse is nothing if not a hyphenate of predatory talents). Lang provides us with an exciting climax where at a stage show Mabuse re-hypnotises Von Wenk, successfully placing him fully under the influence he couldn’t manage before. As Weltemann, the magical mentalist, thematically Klein-Rogge is reminiscent of Dr Caligari, tapping into our subconscious to brainwash willing subjects – echoing another strand of Expressionism. Unbeknownst to the transfixed audience, he secretly compels Von Wenk to drive his car off a cliff. Von Wenk’s friends sense something is wrong and mercifully he is rescued from auto-destruction. Finally, Mabuse is cornered and it is here that the undead souls of his victims come to haunt him superbly, ordering him with relish to “Take over the bank. Mabuse”. When Von Wenk arrives, all that is left of his awesome arch-enemy is a tousle-haired, shattered old man, his mind unravelled by the supernatural revenge bestowed upon him. DR MABUSE is an enjoyable crime thriller with macabre elements, and Lang even finds time to tease his fellow Expressonists with an exchange in a club where one of Mabuse’s chums asks him what he Thinks of the movement. “Expressionism is a pastime” he replies playfully, though Klein-Rogge’s forceful performance shows the stark simplicity and power of Expressionism throughout.